A Segway-like balancing robot which weighs more than 140 kgs (300 lbs) and can reach a height of 1.90m (6' 2''). 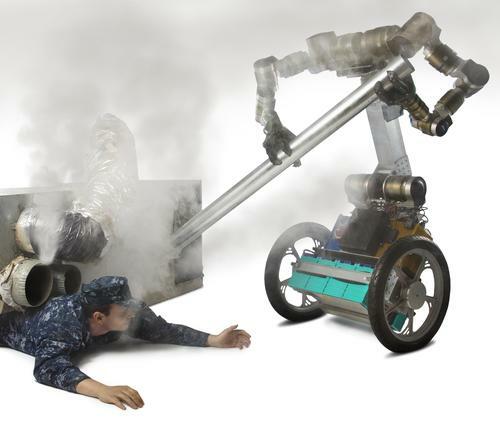 The size of the robots allows dynamic manipulation, that is, leveraging its weight and momentum to move heavy objects. See this video where Krang manipulates two obstacles, 100 kgs (220 lb) and 40 kgs (90 lb), to clear a doorway and build a bridge in a search and rescue scenario. The Krang is the main robot that leads the MacGyver project which focuses on using random objects in the environment to overcome challenges. Imagine you are in a search and rescue scenario. There are bunch of bricks, broken wooden plates and soft ply wood, and you need to get out of a blocked door or rescue someone under some rubble. What objects would you use? How? The main collaborators on the Krang/MacGyver projects are the Ph.D. students Munzir Zafar, and Saul Reynolds-Haertle. This semester, the project involves the following undergraduate students: Peng Hou, Greg Patrick and Xinyan Yan. Robot model If you'd like to obtain a 3D-mesh of the robot, you can do so here and visualize it on your iPhone/iPad/Android device with the MeshLab application. Tutorial If you are a new undergraduate and master student, I have prepared a tutorial that explains the basic tools we use in the lab such as git, C++, debugging (gdb), compiling (CMake/g++), plotting (Matlab/Octave), documentation (Doxygen/latex) and etc. file and send me and Mike Stilman an email for the password. Note the official project website can be found here.